George Clooney is used to being the center of attention both onscreen and off. But he has been playing some particularly relevant roles of late—both in the real world and on screen. In Hollywood he is making a splash with the newest political thriller, “The Ides of March,” which screened at a Satellite Sentinel Project benefit event last night at the Geffen Playhouse in Los Angeles and opens in theaters on October 7. Playing a presidential hopeful in a film released as the U.S. election season is heating up, Clooney’s “Governor Mike Morris” will no doubt resonate with audiences. But his work with the Satellite Sentinel Project is generating ample real-life significance as it spotlights human rights abuses in Sudan. 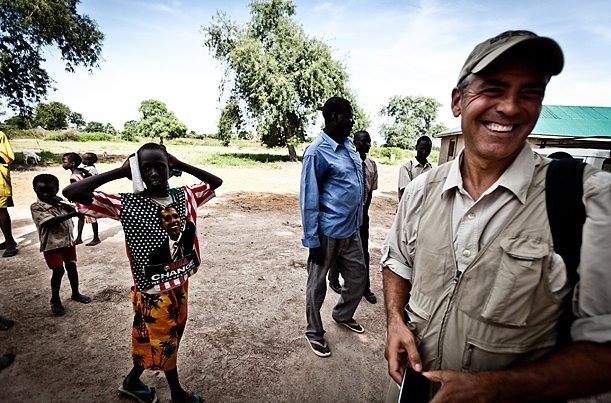 This uncompromising dedication is apparent in Clooney’s work in Sudan. With five other celebrities he founded Not On Our Watch, a group committed to “robust international advocacy and humanitarian assistance.” And in 2010 after a trip to Sudan with Enough Project Co-Founder John Prendergast, Clooney launched the Satellite Sentinel Project to cast a spotlight on atrocities against civilians being committed in in real-time. SSP is a collaboration between The Enough Project, Harvard Humanitarian Initiative, or HHI, DigitalGlobe, and Trellon. HHI analyzes the imagery obtained by “Clooney’s satellites” — actually the keen, clear eyes of DigitalGlobe's constellation of three satellites — and writes reports, which the Enough Project then uses to advocate for policy recommendations. In less than a year, the SSP has reported on attacks in Abyei, evidence of mass graves in South Kordofan, and troop build-ups in Blue Nile.